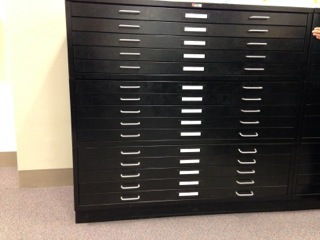 Free flat files at Tufts! *I just found out that they are offering the files to non-profits initially. Tufts has numerous map cases available that are looking for a new home. Each unit is 5 drawers, and we have stacked them 3 units high. The cases will be available first come, first serve and are located on the Medford/Somerville campus. 3 Responses to Free flat files at Tufts! FYI, they are making the files available first to non-profits.